In the powerful third installment in her Lowcountry Summer series, New York Times bestselling author Mary Alice Monroe returns to the sultry beauty of the Carolina coast and the Muir sisters—an unforgettable tale of family bonds as strong and steady as the tides. It is the last summer that Marietta “Mamaw” Muir and her three “summer girls” will ever spend at their beloved Sea Breeze before it is sold. As the end draws near, Mamaw and half-sisters Dora, Carson, and Harper struggle to find new places in the world. Harper intended to stay only a weekend, but a rift with her wealthy, influential mother left her without a home. Free from her mother’s tyranny and encouraged by her family on Sullivan’s Island, Harper has at last discovered her talents and independent spirit. Now, the historic beach house’s fate hinges on her courage to decide the course of her own life. To do so, she must recognize her newfound strengths and accept love fully into her life—of her family, of the lowcountry, and, most of all, of ex-Marine Taylor McClellan, the wounded warrior who has claimed her heart. 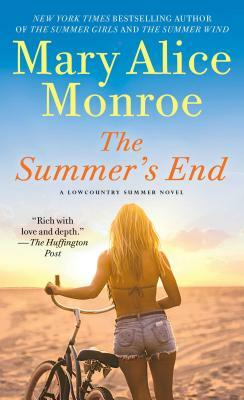 "Readers who enjoy Monroe's blend of fiction that weaves family drama by the seaside and environmental issues will want to pick up a copy." "To describe Monroe’s books is like trying to describe the Lowcountry itself. There is warmth and beauty found on every page, and it is simple yet complex in its nature. Storms may rage in the night, but morning always follows." "If you are searching for a great beach read—friendship, family, a touch of ecology and romance—well, then, this is the book for you... keep tissues by your side as you read this book." "Mary Alice Monroe is an exquisite author who blends the magnificent Lowcountry setting with human emotions...This is a must read for fans of Southern literature." "This is the perfect summertime beach read." "Written with convincing Southern charm and thoughtfulness, The Summer Wind explores the bonds of sisterhood and the challenges of modern womanhood with warmth and genuine affection." "Monroe’s writing is as lean and elegant as the lovely young women who grace the beach... a cool, refreshing breeze of a read." "Mary Alice Monroe has a way with words when it comes to her characters and her locations. No other author has ever made me want to be sitting on the beach more." "Once you get to know the sisters and Mamaw, you’ll want to follow their lives beyond the summer, and the beach." "The Summer Wind makes for an excellent beach read this summer."